One of the most wonderful things about living on or visiting Anna Maria Island is the fact that it’s possible to enjoy meals outdoors almost year-round. Sometimes I forget this, when it comes to eating on our own deck. I assume it’s either too hot or too cold. Then I walk by one of the popular restaurants and notice the outdoor deck is full. When given a choice, restaurant-goers seem to choose to sit outdoors, if at all possible. They must be hardier than I am at home. Sometimes that’s because the restaurant has made a few special arrangements to keep the customers comfortable. For example, in winter, the breeze can be a major factor in making outdoor dining too cold, and so it’s obviously a good idea for a restaurant to erect some sort of barrier to keep the dining area from being cool. This could be in the form of plantings, or even a wall or plastic curtain. Another way to keep winter deck diners warm is with large heaters, which seem to be more and more prevalent at fine restaurants. The other day I enjoyed a wonderful lunch on the deck at the Sand Bar, and the heater really warmed the otherwise crisp air. It feels sort of decadent, but since we keep our house unheated as many days as possible, I suppose we can occasionally indulge in such a luxury when we go out. Summer is a more challenging time to eat outdoors on the island. It’s not only the heat and humidity, but the bugs, which can be uncomfortable. We actually do not have as many bugs as I would have thought, but it doesn’t take many “no-see-ums” to interfere with the enjoyment of a nice meal. This is when the breeze can help local dining establishments. 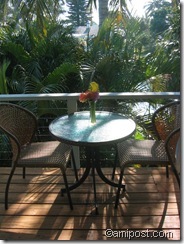 A place like Rotten Ralph’s, with tables on a deck right over the water, is unlikely to have many bugs. With this in mind, we have occasionally eaten a meal on our dock, instead of on the deck that’s part of the house, and I think it has made a difference in terms of insect bites. The temperature has also been cooler because of the breeze over the water. The restaurants that are right on Anna Maria’s Gulf Beach, such as the Sand Bar, the Beach House, the Gulf Front Café and Café on the Beach, are all more tolerable in summer because of the sea breeze. It doesn’t take much to enjoy outdoor dining at home. Having nice patio furniture makes a difference. Not only is it a pleasure to look at good quality patio furniture through your window, it makes the outdoor dining space truly like an additional outdoor room, expanding your home. Good patio furniture also is less likely to blow around in stormy weather. After many years of using inexpensive plastic garden furniture, we have been relieved not to have to stack it or go find it whenever the wind picks up. 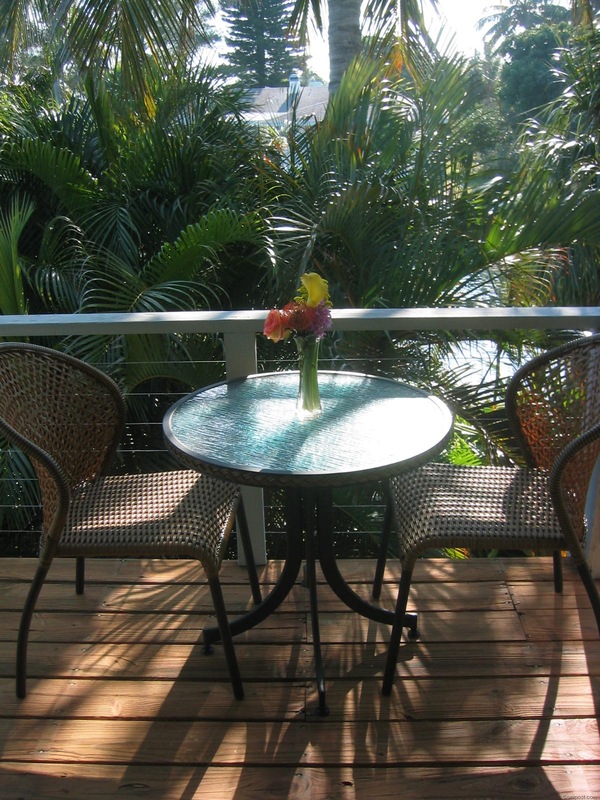 Of course, you don’t want to get deck furniture that is too heavy, because when a hurricane approaches, it’s best to bring it inside, and that can be a big chore. Perhaps the most wonderful outdoor dining on Anna Maria Island is done on a boat, or on the beach. We are so lucky to have all these choices. Bon appétit! This entry was posted in Restaurants and tagged outdoor dining, outdoor restaurants, patio furniture, patio restaurants, waterfront dining on January 29, 2010 by Mike.